A low pressure system developed around 25 S 96 E (or about 1700km west of Carnarvon, WA) in response to a lagging surface trough extending from a cold front crossing the southwest of Western Australia on 08/1200 UTC. By 10/0000 UTC the LOW had barely intensified but was now located approximately 450km WNW of Perth, WA. Over the next 24 hours the LOW intensified significantly - dropping 17 hPa to 996 hPa - while skirting around the southwest coast of WA. A number of severe weather warnings were issued by the Bureau of Meteorology during the 10th and 11th July for damaging wind gusts possibly reaching 125 km/h. This was certainly the case with damage to property reported at a number of coastal locations. These types of subtropical lows which intensify near Southwest Western Australia are not uncommon and are normally unworthy of much discussion. However, this system gathered interest as it continued a slow eastward movement across the Great Australian Bight. The satellite signature between 11/0000 UTC and 12/1200 UTC was fairly typical of a mid-winter cold cored LOW with a large well dispersed spiral cloud pattern. By 13/0000 UTC most of the outer cloud had dissipated leaving a small circular core of convection with an eye feature resembling a compact tropical cyclone. The system edged north of east and crossed Kangaroo Island, South Australia, between 13/1000 and 13/1500 UTC. At Cape Willoughby northerly wind gusts reached 53 kts by 8.37pm, peaking at 64 kts at 12.17am. The centre of the LOW passed south of this location. It reported a shift in winds to west then southwest by 7am. 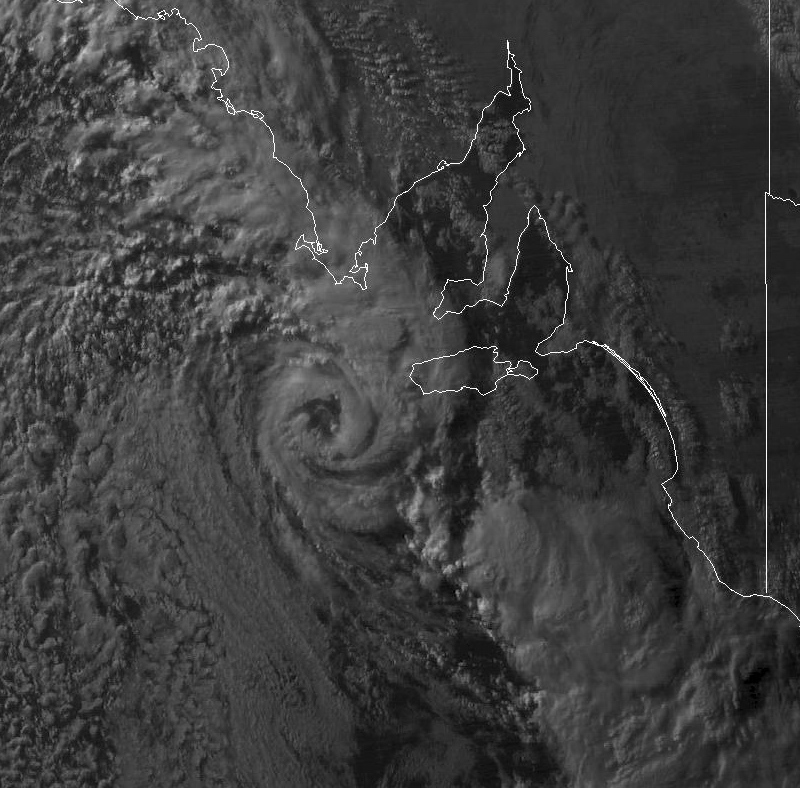 The Adelaide radar revealed a well-defined 40-50 km diameter eye as the LOW was centred over the western parts of Kangaroo Island. The eye contracted somewhat but remained a feature as the LOW headed slowly southeast and impacted the Cape Jaffa area by 14/0000 UTC. The weakened but still discernable LLCC made a small clockwise loop of the region during the following 24 hours before again crossing the coast north of Cape Jaffa at 15/0000 UTC. Analysis of the LOW during 13/14 July shows the system had a cold core at the synoptic scale and a warm core at the mesoscale. I'll add some more graphics to this report shortly. Great report so far Micheal! Interactive loops of radar, MSL charts and satpics. As that one passed a fair way south of Adelaide, almost at the limits of the Buckland Park radar, I am thinking the older Sellicks Hill one (about 100km south) may show a bit more detail if anyone has that available. Hi Richary - I've checked the old radar too and it displays a very similar pattern despite being closer to the centre of the low at times. The newer radar certainly does a better job picking up more distant precipitation.